World Rabies Day is a global health observance that seeks to raise awareness about rabies and enhance prevention and control efforts. To support this effort, the S.C. Department of Health and Environmental Control invited South Carolinians to send in photos of their vaccinated pets and livestock. Thank you to everyone who sent in photos. Together we can #EndRabies! Rabies is a deadly virus that kills people, pets, and wildlife across the globe. Help us end rabies by raising awareness in your area and by keeping your pets up-to-date on their rabies vaccinations - which protects not only your pet, but also you and your family from the virus. For more information, visit www.scdhec.gov/rabies. Chica is enjoying the outdoors because she has a rabies vaccine. Clover from Columbia, SC is proud to be vaccinated against rabies. Cooper is resting easy knowing he has his rabies vaccine. 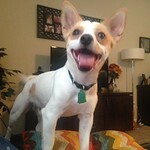 Dexter in Columbia, SC is adorable and proud to be vaccinated against rabies. This sweet face says "thank you for protecting me from rabies with a vaccine." Does your dog have a rabies vaccine? These cute pups have their vaccines for rabies. There is an approved rabies vaccine for horses. This is one smart pup. Josey and Pickles have their vaccines - does your dog? Maeby & Buster from Columbia are celebrating World Rabies Day.